Ajax Tocco manufactures two types of induction melting equipment for steel: Channel type superheaters for steel mill applications and coreless furnaces typically used in steel foundries. 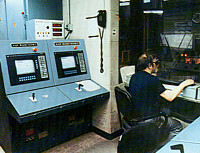 Four channel furnaces, plus all melt shop functions are monitored with this Ajax TOCCO computerized melt system. Primary melting is done here with four 34 ton, 2,000 KW Jet-Flow furnaces for iron. 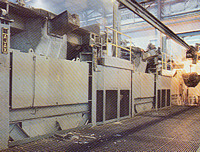 Ajax TOCCO was responsible for the complete melt shop, from overhead cranes to hot metal handling. 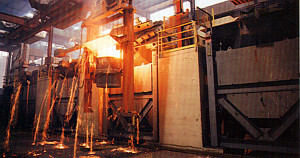 Three 40 ton, 1750 KW Jet-Flow furnaces are used to produce 160 tons of gray and ductile iron per day. "Off peak" melting saves them over $35.00 per ton and Jet Flow inductors enable them to melt plant generated chips and borings.